Italy is a Catholic country and on Good Friday most Italians eat fish. Pasta con le Sarde is made with bucatini (thick long tubes of pasta) and the main ingredients are sardines (buy fillets for ease), wild fennel (or fennel bulbs) pine nuts, saffron and topped by fried breadcrumbs. as you can see I have made this dish at other times. Muslim Arabs took control of North Africa from the Byzantines and Berbers and began their second conquest of Sicily in 827 from Mazara, the closest point to the African coast and by 902 they well and truly conquered Sicily. The Muslims, were known as Moors by the Christians and by the time of the Crusades, Muslims were also referred to as Saracens. The Muslim Arabs, via North Africa ruled Sicily till 1061 A.D. This recipe can only be Sicilian and is particularly common in Palermo. The origins of pasta chi sardi (Sicilian) are said to be Arabic. When a band Arab troops first landed in Sicily via North Africa, the Arab cook was instructed to prepare food for the troops. The cook instructed the troops to forage for food. 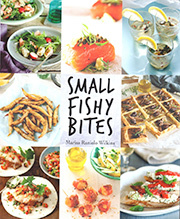 He made do with what they presented – plentiful was the wild fennel and the fish (sardines). To these he added exotic ingredients and flavours of Arabs and North Africans – the saffron, dried fruit and the nuts and so Pasta con le Sarde was born. At this time of year, just before Easter, many readers look at my blog searching for Easter food ideas. The baked version is fancy enough to present on Easter Sunday – if you are that way inclined. Pasta con le Sarde can be eaten hot or cold and it can be baked…..made into a tummàla (Sicilian word from the Arabic) – Italian timballo and French timbale – a dish of finely minced meat or fish cooked with other ingredients and encased in rice, pasta or pastry. The dry breadcrumbs are used to line and cover the contents in the baking pan, the long bucatini can be coiled around the pan and the sardine sauce becomes the filling. 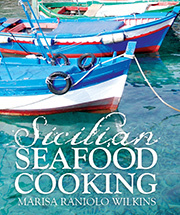 The recipe for Pasta con le Sarde is from my book Sicilian Seafood Cooking. This is a slightly modified version of the recipe. I found very little wild fennel this time of year so I used fennel bulbs – there were a few available at the Queen Victoria Market. Because I only found a very small quantity of wild fennel I added some ground fennel seeds and a splash of Pernod to enhance the fennel taste. If you can get wild fennel, place it into some cold, salted water (enough to cook the pasta) and boil it for 10-15 minutes (it can be left in the water for longer). The green tinged, fennel-flavoured water is used to cook the pasta — it will flavour and colour the pasta. Reserve some of the tender shoots of wild fennel raw to use in the cooking of the sauce. Drain the cooked fennel and keep the fennel-flavoured water to cook the pasta. Some of the cooked fennel can be added to the pasta sauce. coarse breadcrumbs, 100 grams made with day old, quality bread (sourdough/pasta dura) lightly fried in some oil. I added pine nuts (pine- nuts-overkill), grated lemon peel, a little cinnamon and sugar to my breadcrumbs. Slice the fennel into thin slices and cut fronds finely. Cut about two thirds of the sardine fillets into thick pieces. Reserve whole fillets to go on top and provide visual impact. Heat oil in shallow wide pan. Sauté the onions over medium heat until golden. Add the fennel and cook till slightly softened. Add pine nuts, currants (drained) and almonds. Toss gently until heated. Add the sliced sardines, salt and pepper or chili. Cook for about 5-7 minutes, stirring gently. Add ground fennel seeds or a splash of Pernod to enhance the fennel taste – I did this because I only found a very small quantity of wild fennel. Add the anchovies (try to remove any bones if there are any) and as they cook, crush them with back of spoon to dissolve into a paste. Add saffron (and the soaking water) and continue to stir and cook gently. Boil bucatini in the fennel water (if you have it) until al dente. Fry the whole fillets of sardines in a separate frying pan, keeping them intact. Remove them from the pan and put aside. Mix the pasta with the sauce, sprinkle with some of the breadcrumbs and top with the sardine fillets. The photos are of left over pasta that I made into a timballo. It was only for my household, nothing fancy and was a way of using leftovers. Oil a baking tray or an ovenproof dish (traditionally a round shape is used) and sprinkle with the toasted breadcrumbs to prevent sticking. Place a layer of the dressed pasta on the breadcrumbs – I coiled the bucatini around the baking pan, then added the sauce (solids- sardines, nuts etc) and placed more coiled bucatini on top. if you want a deeper crust you will need greater quantities of breadcrumbs. Cover with more breadcrumbs, sprinkle with extra virgin olive oil, cover with foil and bake in preheated 200°C for approximately 15 minutes. Remove the foil and bake for another 10 minutes. When the dish is baked, the breadcrumbs form a crust. My mother always made this dish around this time of year. A most delicious offering. This is my favourite Sicilian dish. My mother-in-law (Sicilian housewife extraordinaire and AMAZING cook) found this out, and now she makes it for me all the time! I’m so lucky! I’m looking forward to making this dish. I’ve never tasted it but since we like sardines, pasta, and fennel this dish will surely be a winner. I hope all is well with you. Buona Pasqua!